Sicily. The largest island in the Mediterranean and situated at the tip of the boot of Italy (some would say it looks like a soccer ball being kicked by a foot), this beautiful island has so much to offer travellers. 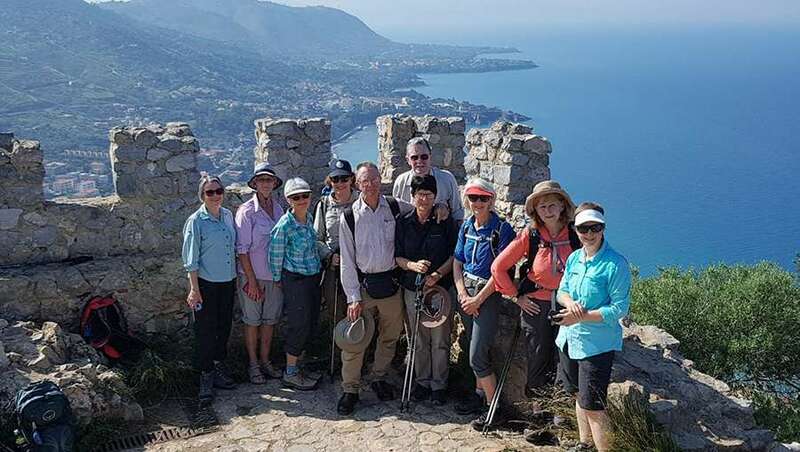 Our team member Bronny recently escorted two separate groups through this glorious part of the world on a leisurely walking and food tour. 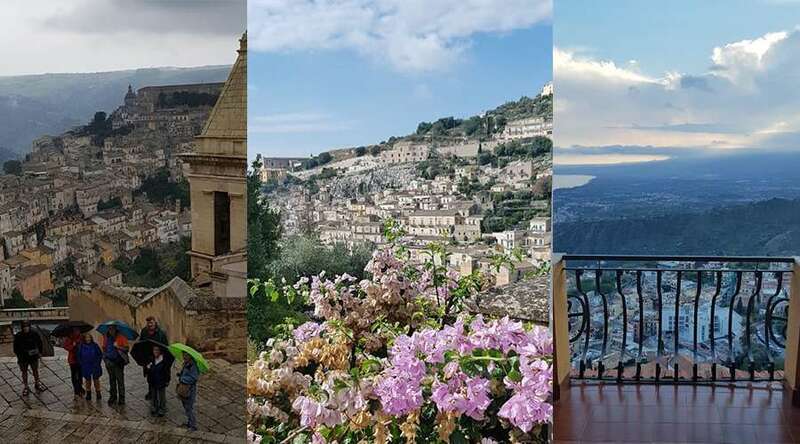 We’ve asked her to give us her highlights of the 11-day trip and why she recommends a walking trip in Sicily. How much walking did you do? Anywhere from 1 to 2 hours a day to 4 hours on some days. Was it continuous each day, or were there other means of transportation? How fit/ active did travellers have to be? Our days were full, and so a good degree of mobility and being comfortable with easy to moderate walks was necessary. 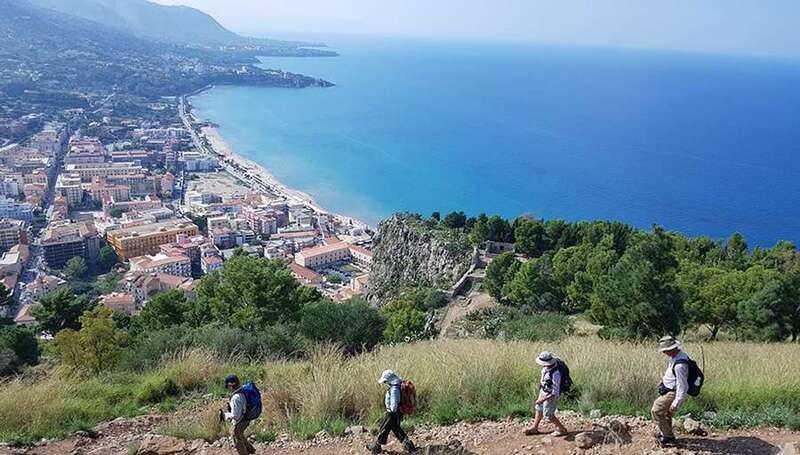 What do you think the benefits are of walking your way through Sicily, compared to other itineraries? Our combination of on foot rambles and the access to our private minibus gave us the best of both worlds. 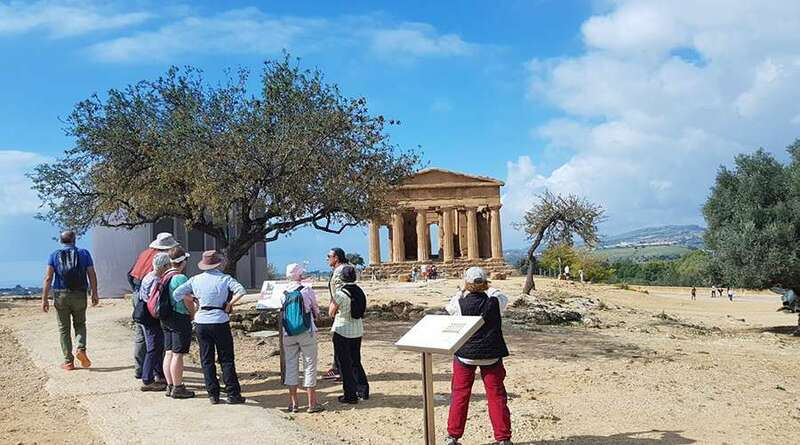 We had a slow and close-up look at landscapes and archaeological sites away from the major tourist crowds while gently rambling along and then we had our private minibus to get us to areas that were further afield. 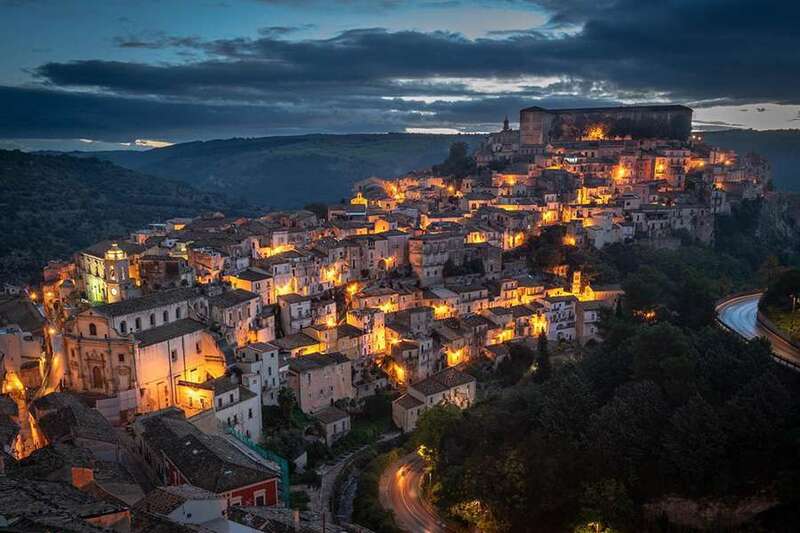 Italy is known for its amazing food – and Sicily is largely responsible for this reputation. What sorts of local delicacies did the group indulge in on the way? Oh my!!! The food was amazing – quite often it was the simplicity and the freshness that was so appealing and at other times the sheer variety! Pizzas were a favourite – made the Sicilian way, simple toppings with the freshest ingredients. 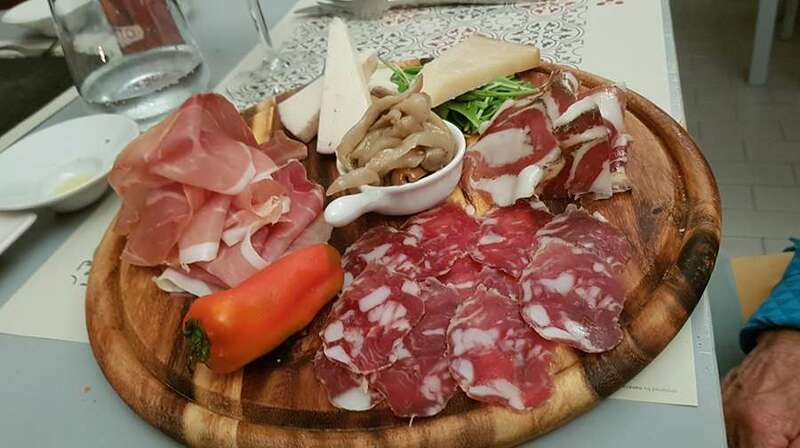 Antipasto plates were to die for – amazing cheeses and cured meats, grilled veges and juicy olives. I think the calf spleen sandwich was probably not SO popular but some of the group pronounced it quite tasty! Cannoli (crisp sweet biscuit rolls stuffed with sweet fresh ricotta cheese) for breakfast (or any time!) went down very well with everyone. Cannoli, Bruschetta and Burrata cheese – just some of the delicious Sicilian cuisine. Is Sicily suitable for people with dietary requirements? Absolutely! There is so much variety and flavours of cheese, fruits and vegetables you are spoiled for choice. 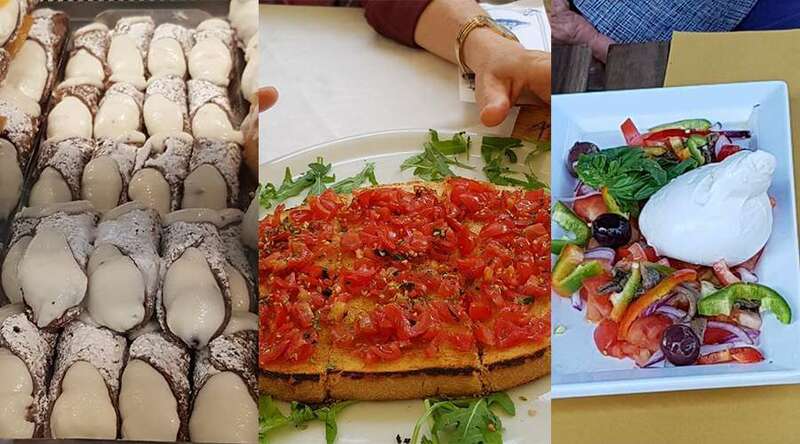 Italy is one of the leading countries researching gluten free food alternatives and everywhere we went gluten free options were readily available and just as tasty and delightful. What were the landscapes like between the cities you were walking? The Sicilian landscape surprised me. For such a small island (compared to Australia) it had a BIG landscape. It’s very mountainous along the coastal regions and big wide horizons in the interior agricultural land, dotted with ancient hilltop towns. What historical sites did you see along the way? The history of settlement goes back to the Phoenicians in 8 BC. We saw some ancient stone burial mounds dating to then. Greek temples dating back to 480 BC. 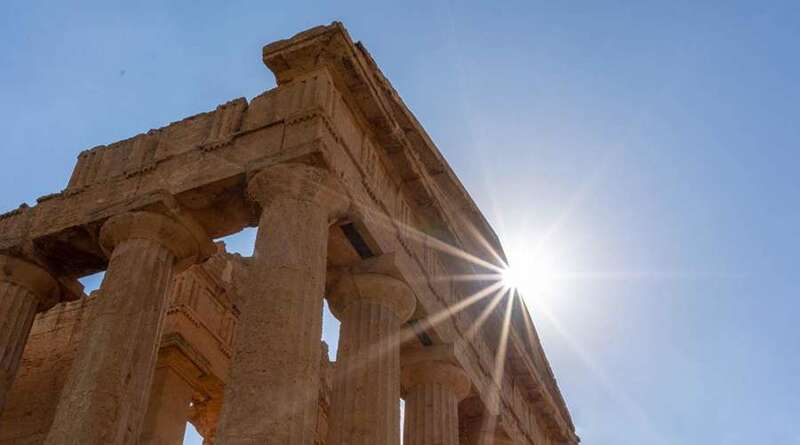 UNESCO Heritage Greek and Roman amphitheatres in Taormina and Siracusa, medieval towns everywhere and grand Baroque buildings and cathedrals dating back to the reconstruction after the 17th century mighty eruption of Mt Etna. We also saw amazing churches and cathedrals built in the 10th and 11th century with acres of glass tiled mosaics covering almost every inch of walls, ceilings and floors. Mt Etna is an iconic site in Sicily, what was it like experiencing the volcano? What cities did you visit along the way? We started in Palermo – a very old city with narrow laneways twisting in every direction. It’s compulsory to just launch into them with the intention of getting lost and discovering the local way of life away from the ‘tourist’ streets. Taormina, nestled between the blue Mediterranean Sea and the looming mass of Mt Etna and the graceful and elegant coastal town of Siracusa. Did the groups have a favourite city? Siracusa (Syracuse) delighted everyone. We stayed deep in the heart of the old city in Ortigia which is in fact an island off the mainland. Any tips for what travellers should do while visiting these cities? In Palermo there is the magnificent Massimo Opera House and some of the group went to a performance, which they loved. There are guided tours of the building which are highly recommended. There is a history of puppetry telling medieval stories of knights and damsels in distress and our Pupi (puppet) Show experience in Siracusa was clever, funny and delightful. A performance of all the popular opera arias in Taormina in an old church in the old town is also a must. As you can see there are many advantages of exploring Sicily by foot. 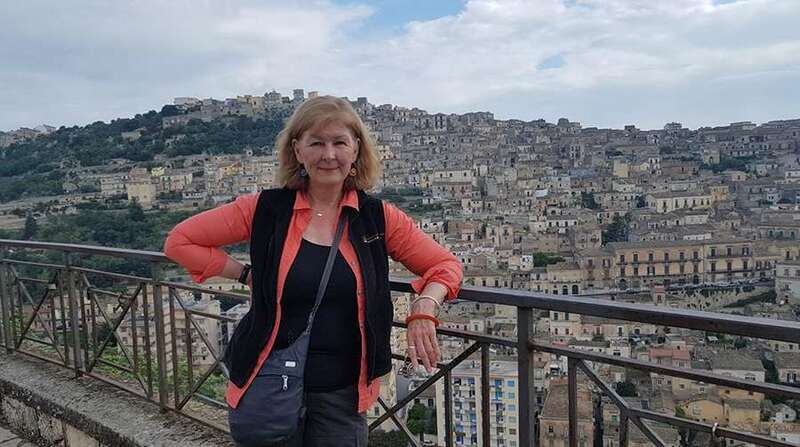 If a walking tour isn’t quite what you’re after, there are also a fantastic range of food tours or general small group tours that will show you the very best of this incredible part of the world. Contact our friendly consultants if you’d like to know more.